Sir Ernest Henry Shackleton CVO OBE FRGS (/ˈʃækəltən/; 15 February 1874 – 5 January 1922) was a British polar explorer who led three British expeditions to the Antarctic. He was one of the principal figures of the period known as the Heroic Age of Antarctic Exploration. Born in Kilkea, County Kildare, Ireland (then part of the United Kingdom of Great Britain and Ireland), Shackleton and his Anglo-Irish family moved to Sydenham in suburban south London when he was ten. 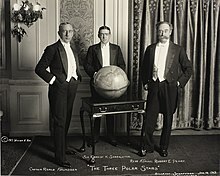 His first experience of the polar regions was as third officer on Captain Robert Falcon Scott's Discovery Expedition 1901–1904, from which he was sent home early on health grounds, after he and his companions Scott and Edward Adrian Wilson set a new southern record by marching to latitude 82°S. During the second expedition 1907–1909 he and three companions established a new record Farthest South latitude at 88°S, only 97 geographical miles (112 statute miles, 180 km) from the South Pole, the largest advance to the pole in exploration history. Also, members of his team climbed Mount Erebus, the most active Antarctic volcano. For these achievements, Shackleton was knighted by King Edward VII on his return home. After the race to the South Pole ended in December 1911 with Roald Amundsen's conquest, Shackleton turned his attention to the crossing of Antarctica from sea to sea, via the pole. To this end, he made preparations for what became the Imperial Trans-Antarctic Expedition, 1914–17. Disaster struck this expedition when its ship, Endurance, became trapped in pack ice and was slowly crushed before the shore parties could be landed. The crew escaped by camping on the sea ice until it disintegrated, then by launching the lifeboats to reach Elephant Island and ultimately the inhabited island of South Georgia, a stormy ocean voyage of 720 nautical miles and Shackleton's most famous exploit. In 1921, he returned to the Antarctic with the Shackleton–Rowett Expedition, but died of a heart attack while his ship was moored in South Georgia. At his wife's request, he was buried there. Away from his expeditions, Shackleton's life was generally restless and unfulfilled. In his search for rapid pathways to wealth and security, he launched business ventures which failed to prosper, and he died heavily in debt. Upon his death, he was lauded in the press but was thereafter largely forgotten, while the heroic reputation of his rival Scott was sustained for many decades. Later in the 20th century, Shackleton was "rediscovered", and rapidly became a role model for leadership as one who, in extreme circumstances, kept his team together in a survival story described by cultural historian Stephanie Barczewski as "incredible". In his 1956 address to the British Association, Sir Raymond Priestley, one of his contemporaries, said "Scott for scientific method, Amundsen for speed and efficiency but when disaster strikes and all hope is gone, get down on your knees and pray for Shackleton", paraphrasing what Apsley Cherry-Garrard had written in a preface to The Worst Journey in the World. In 2002, Shackleton was voted eleventh in a BBC poll of the 100 Greatest Britons. Shackleton was born on 15 February 1874 in Kilkea, County Kildare, Ireland. His father, Henry Shackleton, tried to enter the army, but his poor health prevented him from doing so. He became a farmer instead, settling in Kilkea. The Shackleton family are of English origin, specifically from Yorkshire. Abraham Shackleton, an English Quaker, moved to Ireland in 1726 and started a school at Ballitore, County Kildare. 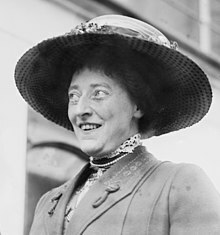 Shackleton's mother, Henrietta Letitia Sophia Gavan, was descended from the Fitzmaurices, an Anglo-Irish family which had arrived in Ireland during the Anglo-Norman Invasion. Ernest was the second of their ten children and the first of two sons; the second, Frank, achieved notoriety as a suspect, later exonerated, in the 1907 theft of the Irish Crown Jewels. In 1880, when Ernest was six, Henry Shackleton gave up his life as a landowner to study medicine at Trinity College, Dublin, moving his family to the city. Four years later, the family moved again, from Ireland to Sydenham in suburban London. Partly this was in search of better professional prospects for the newly qualified doctor, but another factor may have been unease about their Anglo-Irish ancestry, following the assassination by Irish nationalists of Lord Frederick Cavendish, the British Secretary for Ireland, in 1882. From early childhood, Shackleton was a voracious reader, a pursuit which sparked a passion for adventure. He was schooled by a governess until the age of eleven, when he began at Fir Lodge Preparatory School in West Hill, Dulwich, in southeast London. At the age of thirteen, he entered Dulwich College. The young Shackleton did not particularly distinguish himself as a scholar, and was said to be "bored" by his studies. He was quoted later as saying: "I never learned much geography at school ... Literature, too, consisted in the dissection, the parsing, the analysing of certain passages from our great poets and prose-writers ... teachers should be very careful not to spoil [their pupils'] taste for poetry for all time by making it a task and an imposition." In his final term at the school he was still able to achieve fifth place in his class of thirty-one. Although Discovery was not a Royal Navy unit, Scott required the crew, officers and scientific staff to submit to the conditions of the Naval Discipline Act, and the ship and expedition were run on Royal Navy lines. Shackleton accepted this, even though his own background and instincts favoured a different, more informal style of leadership. Shackleton's particular duties were listed as: "In charge of seawater analysis. Ward-room caterer. In charge of holds, stores and provisions […] He also arranges the entertainments." The party set out on 2 November 1902. The march was, Scott wrote later, "a combination of success and failure". A record Farthest South latitude of 82° 17' was reached, beating the previous record established in 1900 by Carsten Borchgrevink. [a] The journey was marred by the poor performance of the dogs, whose food had become tainted, and who rapidly fell sick. All 22 dogs died during the march. The three men all suffered at times from snow blindness, frostbite and, ultimately, scurvy. On the return journey, Shackleton had by his own admission "broken down" and could no longer carry out his share of the work. He later denied Scott's claim in The Voyage of the Discovery, that he had been carried on the sledge. He was in a seriously weakened condition; Wilson's diary entry for 14 January reads: "Shackleton has been anything but up to the mark, and today he is decidedly worse, very short winded and coughing constantly, with more serious symptoms that need not be detailed here but which are of no small consequence one hundred and sixty miles from the ship". On 4 February 1903, the party finally reached the ship. After a medical examination (which proved inconclusive), Scott decided to send Shackleton home on the relief ship Morning, which had arrived in McMurdo Sound in January 1903. Scott wrote: "He ought not to risk further hardship in his present state of health." There is conjecture that Scott's motive for removing him was resentment of Shackleton's popularity, and that ill-health was used as an excuse to get rid of him. After a period of convalescence in New Zealand, Shackleton returned to England via San Francisco and New York. As the first significant person to return from the Antarctic, he found that he was in demand; in particular, the Admiralty wished to consult him about its further proposals for the rescue of Discovery. With Sir Clements Markham's blessing, he accepted a temporary post assisting the outfitting of the Terra Nova for the second Discovery relief operation, but turned down the offer to sail with her as chief officer. He also assisted in the equipping of the Argentinean corvette Uruguay, which was being fitted out for the relief of the stranded Swedish Antarctic Expedition under Nordenskiöld. In search of more permanent employment, Shackleton applied for a regular commission in the Royal Navy, via the back-door route of the Supplementary List, but despite the sponsorship of Markham and of the president of the Royal Society, he was not successful. Instead, he became a journalist, working for the Royal Magazine, but he found this unsatisfactory. 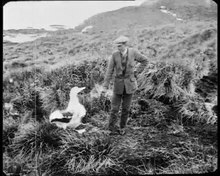 He was then offered, and accepted, the secretaryship of the Royal Scottish Geographical Society (RSGS), a post which he took up on 11 January 1904. On 9 April 1904 he married Emily Dorman (1868 - 1936), with whom he had three children: Raymond, Cecily, and Edward (15 July 1911 - 22 September 1994), himself an explorer and later a politician. In 1905, Shackleton became a shareholder in a speculative company that aimed to make a fortune transporting Russian troops home from the Far East. Despite his assurances to Emily that "we are practically sure of the contract", nothing came of this scheme. He also ventured into politics, unsuccessfully standing in the 1906 General Election as the Liberal Unionist Party's candidate for Dundee in opposition to Irish Home Rule. [b] In the meantime he had taken a job with wealthy Clydeside industrialist William Beardmore (later Lord Invernairn), with a roving commission which involved interviewing prospective clients and entertaining Beardmore's business friends. Shackleton by this time was making no secret of his ambition to return to Antarctica at the head of his own expedition. Beardmore was sufficiently impressed with Shackleton to offer financial support,[c] but other donations proved hard to come by. Nevertheless, in February 1907, Shackleton presented to the Royal Geographical Society his plans for an Antarctic expedition, the details of which, under the name British Antarctic Expedition, were published in the Royal Society's newsletter, Geographical Journal. The aim was the conquest of both the geographical South Pole and the South Magnetic Pole. Shackleton then worked hard to persuade others of his wealthy friends and acquaintances to contribute, including Sir Philip Lee Brocklehurst, who subscribed £2,000 (2011 equivalent £157,000) to secure a place on the expedition; author Campbell Mackellar; and Guinness baron Lord Iveagh, whose contribution was secured less than two weeks before the departure of the expedition ship Nimrod. On 4 August 1907, Shackleton was appointed a Member of the Royal Victorian Order, 4th Class (MVO; the present-day grade of Lieutenant). On 1 January 1908, Nimrod sailed for the Antarctic from Lyttelton Harbour, New Zealand. Shackleton's original plans had envisaged using the old Discovery base in McMurdo Sound to launch his attempts on the South Pole and South Magnetic Pole. Before leaving England, he had been pressured to give an undertaking to Scott that he would not base himself in the McMurdo area, which Scott was claiming as his own field of work. Shackleton reluctantly agreed to look for winter quarters at either the Barrier Inlet (which Discovery had briefly visited in 1902) or King Edward VII Land. The "Great Southern Journey", as Frank Wild called it, began on 29 October 1908. On 9 January 1909, Shackleton and three companions (Wild, Eric Marshall and Jameson Adams) reached a new Farthest South latitude of 88° 23' S, a point only 112 miles (180 km) from the Pole. [d] En route the South Pole party discovered the Beardmore Glacier (named after Shackleton's patron)  and became the first persons to see and travel on the South Polar Plateau. Their return journey to McMurdo Sound was a race against starvation, on half-rations for much of the way. At one point, Shackleton gave his one biscuit allotted for the day to the ailing Frank Wild, who wrote in his diary: "All the money that was ever minted would not have bought that biscuit and the remembrance of that sacrifice will never leave me". They arrived at Hut Point just in time to catch the ship. Besides the official honours, Shackleton's Antarctic feats were greeted in Britain with great enthusiasm. Proposing a toast to the explorer at a lunch given in Shackleton's honour by the Royal Societies Club, Lord Halsbury, a former Lord Chancellor, said: "When one remembers what he had gone through, one does not believe in the supposed degeneration of the British race. One does not believe that we have lost all sense of admiration for courage [and] endurance". The heroism was also claimed by Ireland: the Dublin Evening Telegraph's headline read "South Pole Almost Reached By An Irishman", while the Dublin Express spoke of the "qualities that were his heritage as an Irishman". Shackleton's fellow-explorers expressed their admiration; Roald Amundsen wrote, in a letter to RGS Secretary John Scott Keltie, that "the English nation has by this deed of Shackleton's won a victory that can never be surpassed". Fridtjof Nansen sent an effusive private letter to Emily Shackleton, praising the "unique expedition which has been such a complete success in every respect". The reality was that the expedition had left Shackleton deeply in debt, unable to meet the financial guarantees he had given to backers. Despite his efforts, it required government action, in the form of a grant of £20,000 (2008: £1.5 million) to clear the most pressing obligations. It is likely that many debts were not pressed and were written off. Any future resumption by Shackleton of the quest for the South Pole depended on the results of Scott's Terra Nova Expedition, which left from Cardiff in July 1910. By early 1912, the world was aware that the pole had been conquered, by the Norwegian Roald Amundsen. The fate of Scott's expedition was not then known. Shackleton's mind turned to a project that had been announced, and then abandoned, by the Scottish explorer William Speirs Bruce, for a continental crossing, from a landing in the Weddell Sea, via the South Pole to McMurdo Sound. Bruce, who had failed to acquire financial backing, was happy that Shackleton should adopt his plans, which were similar to those being followed by the German explorer Wilhelm Filchner. Filchner had left Bremerhaven in May 1911; in December 1912, the news arrived from South Georgia that his expedition had failed. [f] The transcontinental journey, in Shackleton's words, was the "one great object of Antarctic journeyings" remaining, now open to him. Shackleton used his considerable fund-raising skills, and the expedition was financed largely by private donations, although the British government gave £10,000 (about £680,000 in 2008 terms). Scottish jute magnate Sir James Caird gave £24,000, Midlands industrialist Frank Dudley Docker gave £10,000 and tobacco heiress Janet Stancomb-Wills gave an undisclosed but reportedly "generous" sum. Public interest in the expedition was considerable; Shackleton received more than 5,000 applications to join it. His interviewing and selection methods sometimes seemed eccentric; believing that character and temperament were as important as technical ability, he asked unconventional questions. Thus physicist Reginald James was asked if he could sing; others were accepted on sight because Shackleton liked the look of them, or after the briefest of interrogations. Shackleton also loosened some traditional hierarchies, expecting all men, including the scientists, to take their share of ship's chores. He ultimately selected a crew of 56, twenty-eight on each ship. Despite the outbreak of the First World War on 3 August 1914, Endurance was directed by the First Lord of the Admiralty, Winston Churchill, to "proceed",[g] and left British waters on 8 August. Shackleton delayed his own departure until 27 September, meeting the ship in Buenos Aires. While Shackleton led the expedition, Captain F. Worsley commanded the Endurance and Lieutenant J. Stenhouse the Aurora. On the Endurance, the second in command was the experienced explorer Frank Wild. The meteorologist was Captain L. Hussey (also an able banjo player). Dr. McIlroy was head of the scientific staff, which included Wordie. Alexander Macklin was one of two surgeons and also in charge of keeping the 70 dogs healthy. Tom Crean was in more immediate charge as head dog-handler. Other crew included James, Hussey, Greenstreet, a carpenter Henry McNeish, and Clark (the biologist). Of later independent fame was the photographer Frank Hurley. There was a (male) cat named Mrs Chippy that belonged to the carpenter Henry McNeish. Mrs Chippy was shot when the Endurance sank, due to the belief it would not have survived the ordeal that followed. Endurance departed from South Georgia for the Weddell Sea on 5 December, heading for Vahsel Bay. As the ship moved southward navigating in ice, first year ice was encountered, which slowed progress. Deep in the Weddell Sea, conditions gradually grew worse until, on 19 January 1915, Endurance became frozen fast in an ice floe. 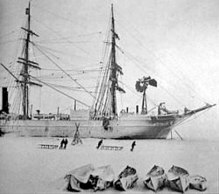 On 24 February, realising that she would be trapped until the following spring, Shackleton ordered the abandonment of ship's routine and her conversion to a winter station. She drifted slowly northward with the ice through the following months. When spring arrived in September, the breaking of the ice and its later movements put extreme pressures on the ship's hull. Until this point, Shackleton had hoped that the ship, when released from the ice, could work her way back towards Vahsel Bay. On 24 October water began pouring in. After a few days, with the position at 69° 5' S, 51° 30' W, Shackleton gave the order to abandon ship, saying, "She's going down! "; and men, provisions and equipment were transferred to camps on the ice. On 21 November 1915, the wreck finally slipped beneath the surface. Shackleton refused to pack supplies for more than four weeks, knowing that if they did not reach South Georgia within that time, the boat and its crew would be lost. The James Caird was launched on 24 April 1916; during the next fifteen days, it sailed through the waters of the southern ocean, at the mercy of the stormy seas, in constant peril of capsizing. On 8 May, thanks to Worsley's navigational skills, the cliffs of South Georgia came into sight, but hurricane-force winds prevented the possibility of landing. The party was forced to ride out the storm offshore, in constant danger of being dashed against the rocks. They later learned that the same hurricane had sunk a 500-ton steamer bound for South Georgia from Buenos Aires. On the following day, they were able, finally, to land on the unoccupied southern shore. After a period of rest and recuperation, rather than risk putting to sea again to reach the whaling stations on the northern coast, Shackleton decided to attempt a land crossing of the island. Although it is likely that Norwegian whalers had previously crossed at other points on ski, no one had attempted this particular route before. For their journey, the survivors were only equipped with boots they had pushed screws into to act as climbing boots, a carpenter's adze, and 50 feet of rope. Leaving McNish, Vincent and McCarthy at the landing point on South Georgia, Shackleton travelled 32 miles (51 km) with Worsley and Crean over extremely dangerous mountainous terrain for 36 hours to reach the whaling station at Stromness on 20 May. "All Safe, All Well", allegedly depicting Shackleton's return to Elephant Island, August 1916. A photograph of the departure of the James Caird in April was doctored by photographer Frank Hurley to create this image. Shackleton immediately sent a boat to pick up the three men from the other side of South Georgia while he set to work to organise the rescue of the Elephant Island men. His first three attempts were foiled by sea ice, which blocked the approaches to the island. He appealed to the Chilean government, which offered the use of Yelcho, a small seagoing tug from its navy. Yelcho, commanded by Captain Luis Pardo, and the British whaler SS Southern Sky reached Elephant Island on 30 August 1916, at which point the men had been isolated there for four and a half months, and Shackleton quickly evacuated all 22 men. The Yelcho took the crew first to Punta Arenas and after some days to Valparaiso in Chile where crowds warmly welcomed them back to civilisation. When Shackleton returned to England in May 1917, Europe was in the midst of the First World War. Suffering from a heart condition, made worse by the fatigue of his arduous journeys, and too old to be conscripted, he nevertheless volunteered for the army. Repeatedly requesting posting to the front in France, he was by now drinking heavily. In October 1917, he was sent to Buenos Aires to boost British propaganda in South America. Unqualified as a diplomat, he was unsuccessful in persuading Argentina and Chile to enter the war on the Allied side. He returned home in April 1918. Shackleton was then briefly involved in a mission to Spitzbergen to establish a British presence there under guise of a mining operation. On the way he was taken ill in Tromsø, possibly with a heart attack. Appointment to a military expedition to Murmansk obliged him to return home again, before departing for northern Russia. Shackleton was specially appointed a temporary major on 22 July 1918. From October 1918 he served with the North Russia Expeditionary Force in the Russian Civil War under the command of Major-General (later Field Marshal Lord) Ironside, with the role of advising on the equipment and training of British forces in arctic conditions. 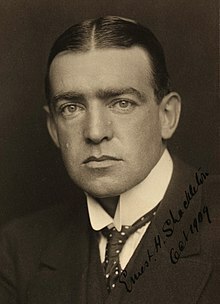 For his "valuable services rendered in connection with Military Operations in North Russia" Shackleton was appointed an Officer of the Order of the British Empire (OBE) in the 1919 King's Birthday Honours, and was also mentioned in despatches by General Ironside. Shackleton returned to England in early March 1919, full of plans for the economic development of Northern Russia. In the midst of seeking capital, his plans foundered when Northern Russia fell to Bolshevik control. He was finally discharged from the army in October 1919, retaining his rank of major. Rowett agreed to finance the entire expedition, which became known as the Shackleton-Rowett Expedition. On 16 September 1921, Shackleton recorded a farewell address on a sound-on-film system created by Harry Grindell Matthews, who claimed it was the first "talking picture" ever made. The expedition left England on 24 September 1921. Macklin, who conducted the postmortem, concluded that the cause of death was atheroma of the coronary arteries exacerbated by "overstrain during a period of debility". Leonard Hussey, a veteran of the Imperial Trans-Antarctic expedition, offered to accompany the body back to Britain; while he was in Montevideo en route to England, a message was received from Emily Shackleton asking that her husband be buried in South Georgia. Hussey returned to South Georgia with the body on the steamer Woodville, and on 5 March 1922, Shackleton was buried in the Grytviken cemetery, South Georgia, after a short service in the Lutheran church, with Edward Binnie officiating. Macklin wrote in his diary: "I think this is as 'the Boss' would have had it himself, standing lonely in an island far from civilisation, surrounded by stormy tempestuous seas, & in the vicinity of one of his greatest exploits." On 27 November 2011, the ashes of Frank Wild were interred on the right-hand side of Shackleton's gravesite in Grytviken. The inscription on the rough-hewn granite block set to mark the spot reads "Frank Wild 1873–1939, Shackleton's right-hand man." During the ensuing decades Shackleton's status as a polar hero was generally outshone by that of Captain Scott, whose polar party had by 1925 been commemorated on more than 30 monuments in Britain alone, including stained glass windows, statues, busts and memorial tablets. A statue of Shackleton designed by Charles Sargeant Jagger was unveiled at the Royal Geographical Society's Kensington headquarters in 1932, but public memorials to Shackleton were relatively few. Likewise, the printed word saw much more attention given to Scott–a forty-page booklet on Shackleton, published in 1943 by OUP as part of a "Great Exploits" series, is described by cultural historian Stephanie Barczewski as "a lone example of a popular literary treatment of Shackleton in a sea of similar treatments of Scott". This disparity continued into the 1950s. 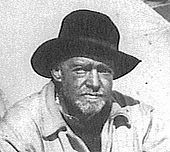 In 1959 Alfred Lansing's Endurance: Shackleton's Incredible Voyage was published. This was the first of a number of books about Shackleton that began to appear, showing him in a highly positive light. At the same time, attitudes towards Scott were gradually changing as a more critical note was sounded in the literature, culminating in Roland Huntford's 1979 treatment of him in his dual biography Scott and Amundsen, described by Barczewski as a "devastating attack". This negative picture of Scott became accepted as the popular truth as the kind of heroism that Scott represented fell victim to the cultural shifts of the late twentieth century. Within a few years, he was thoroughly overtaken in public esteem by Shackleton, whose popularity surged while that of his erstwhile rival declined. In 2002, in a BBC poll conducted to determine the "100 Greatest Britons", Shackleton was ranked 11th while Scott was down in 54th place. In 2001 Margaret Morrell and Stephanie Capparell presented Shackleton as a model for corporate leadership in their book Shackleton's Way: Leadership Lessons from the Great Antarctic Explorer. They wrote: "Shackleton resonates with executives in today's business world. His people-centred approach to leadership can be a guide to anyone in a position of authority". Other management writers were soon following this lead, using Shackleton as an exemplar for bringing order from chaos. The Centre for Leadership Studies at the University of Exeter (United Kingdom) offers a course on Shackleton, who also features in the management education programmes of several American universities. In Boston a "Shackleton School" was set up on "Outward Bound" principles, with the motto "The Journey is Everything". Shackleton has also been cited as a model leader by the US Navy, and in a textbook on Congressional leadership, Peter L Steinke calls Shackleton the archetype of the "nonanxious leader" whose "calm, reflective demeanor becomes the antibiotic warning of the toxicity of reactive behaviour". In 2001, the Athy Heritage Centre-Museum, Athy, County Kildare, Ireland, established the Ernest Shackleton Autumn School, which is held annually, to honour the memory of Ernest Shackleton. In 1993 Trevor Potts re-enacted the Boat Journey from Elephant Island to South Georgia in honour of Sir Ernest Shackleton, totally unsupported, in a replica of the James Caird. In 2002, Channel 4 produced Shackleton, a TV serial depicting the 1914 expedition with Kenneth Branagh in the title role. Broadcast in the United States on the A&E Network, it won two Emmy Awards. In a Christie's auction in London in 2011, a biscuit that Shackleton gave "a starving fellow traveller" on the 1907–09 Nimrod expedition sold for £1250. That same year, on the date of what would have been Shackleton's 137th birthday, Google honored him with a Google Doodle. Bronze portrait bust of Shackleton by Anthony Smith at the South Georgia Museum, located near the cemetery where Shackleton is buried. (Unveiled November 2017). In January 2013, a joint British-Australian team set out to duplicate Shackleton's 1916 trip across the Southern Ocean. Led by explorer and environmental scientist Tim Jarvis, the team was assembled at the request of Alexandra Shackleton, Sir Ernest's granddaughter, who felt the trip would honour her grandfather's legacy. In October 2015, Shackleton's decorations and medals were auctioned; the sale raised £585,000. This team became the first to replicate the so-called "double crossing"; sailing from Elephant Island to South Georgia, and the crossing of the South Georgian mountains from King Haakon Bay (where Shackleton had landed nearly 100 years prior) to Stromness. The expedition very carefully matched legacy conditions, using a replica of the James Caird (named for the project's patron: the Alexandra Shackleton), period clothing (by Burberry), replica rations (both in calorific content and rough constitution), period navigational aids, and a Thomas Mercer chronometer just as Shackleton had used. This expedition was made into a documentary film, screening as Chasing Shackleton on PBS in the United States, and Shackleton: Death or Glory elsewhere on the Discovery Channel. In 2016 a statue of Shackleton by Mark Richards was erected in Athy, sponsored by Kildare County Council. In 2017, the musical play Ernest Shackleton Loves Me by Val Vigoda and Joe DiPietro made its debut in New York City at the Tony Kiser Theater, an Off-Broadway venue. Blended with a parallel story of a struggling composer, the play retells the adventure of Endurance in detail, incorporating photos and videos of the journey. A poplar tree Proper charged with a buckle as in the arms. Or, on a fess Gules, three lozengy buckles, tongues paleways Gold; on a canton of the Second, a cross humettée of the Third. ^ McElrea, Richard, and David Harrowfield. Polar castaways: the Ross Sea party of Sir Ernest Shackleton, 1914-17. McGill-Queen's Press-MQUP, 2004. ^ Aoki, Elaine, et al. "Shipwreck at the Bottom of the World: The Extraordinary True Story of Shackleton and the Endurance." Language Arts 77.5 (2000): 440. ^ Roberts, Peder. "The politics of early exploration." Handbook on the Politics of Antarctica. Edward Elgar Publishing, 2017. ^ "Profile Sir James Wordie". New Scientist. 5 December 1957. Retrieved 25 May 2017. ^ Croome, Angela (2 January 1958). "Antarctic Paraphrase (letter to magazine)". New Scientist. Retrieved 25 May 2017. ^ "His Early Life". Ernestshackleton.net. Retrieved 5 January 2019. ^ a b c d e Huntford, pp. 6–9. ^ a b Mill, pp. 24, 72–80, 104–115, 150. ^ a b c Huntford, p. 11. ^ a b c Huntford, pp. 13–18. ^ a b c Huntford, pp. 25–30. ^ "No. 27322". The London Gazette. 11 June 1901. p. 3926. ^ a b Fiennes, p. 83. ^ a b c Huntford, pp. 143–44. ^ a b c Fisher, pp. 78–80. ^ a b Huntford, pp. 124–28. ^ Emily Mary (née Dorman), Lady Shackleton, by Unknown photographer. Bromide snapshot print, 1910s. National Portrait Gallery x36032. ^ Obituary: Lord Shackleton The Independent, 1994. ^ Morrell & Capparell, p. 32. ^ Riffenburgh 2005, p. 106. ^ a b Riffenburgh 2005, p. 108. ^ Riffenburgh 2005, p. 130. ^ "No. 28049". The London Gazette. 9 August 1907. p. 5447. ^ Riffenburgh 2005, pp. 110–16. ^ Riffenburgh 2005, pp. 143–44. ^ a b Riffenburgh 2005, pp. 151–53. ^ Riffenburgh 2005, pp. 157–67. ^ Riffenburgh 2005, pp. 185–86. ^ Riffenburgh 2005, p. 244. ^ My South Polar Expedition. ^ USA Today, century-old whisky. ^ BBC News, Whisky recreated. ^ a b Fisher, p. 263. ^ "No. 28271". The London Gazette. 16 July 1909. p. 5461. ^ a b Fisher, p. 272. ^ "No. 28321". The London Gazette. 24 December 1909. p. 9763. ^ "No. 28311". The London Gazette. 23 November 1909. p. 8665. ^ a b c Huntford, pp. 298–99. ^ a b Fisher, pp. 242–43. ^ a b Fisher, pp. 284–85. ^ Riffenburgh 2005, p. 298. ^ a b Huntford, p. 367. ^ a b Shackleton, South, preface, pp. xii–xv. ^ Shackleton, South, pp. 29–30. ^ Shackleton, South, p. 36. ^ Shackleton, South, pp. 63–66. ^ Shackleton, South, pp. 75–76. ^ Shackleton, South, p. 98. ^ Shackleton, South, p. 100. ^ Shackleton, South, p. 106. ^ Shackleton, South, pp. 121–22. ^ a b Shackleton, South (film). ^ Shackleton, South, p. 143. ^ a b c d Worsley, pp. 95–99. ^ Alexander, pp. 166–69, 182–85. ^ a b Huntford, pp. 661–63. ^ "No. 30920". The London Gazette (Supplement). 24 September 1918. p. 11408. ^ a b "Damien Wright. Shackleton's men in the Arctic: polar explorers and Arctic warfare in North Russia 1918-19. Orders & Medals Research Society Journal, September 2017, pp 188-199" (PDF). Archived from the original (PDF) on 3 October 2017. Retrieved 25 April 2017. ^ "No. 31376". The London Gazette (Supplement). 30 May 1919. p. 6975. ^ "No. 31938". The London Gazette (Supplement). 8 June 1920. p. 6456. ^ "No. 32261". The London Gazette (Supplement). 15 March 1921. p. 2187. ^ a b c Fisher, pp. 441–46. ^ Riffenburgh 2006, p. 892. ^ a b c Huntford, p. 684. ^ The Spokesman-Review, February 1922. ^ Foster, Jonathan. "Experiments with early wireless". The Secret Life of Harry Grindell Matthews. Archived from the original on 22 January 2016. Retrieved 9 January 2016. ^ a b Fisher, pp. 476–78. ^ a b Fisher, pp. 481–83. ^ Ellis-Petersen, Hannah (13 January 2016). "Polar explorer Ernest Shackleton may have had hole in his heart, doctors say". The Guardian. Retrieved 13 January 2016. ^ a b Barczewski, p. 282. ^ a b c Barczewski, pp. 294–95. ^ "Sir Ernest Shackleton". Athy Heritage Centre-Museum. Archived from the original on 11 April 2009. Retrieved 24 April 2014. ^ Smith, K. Annabelle (21 May 2012). "Reliving Shackleton's Epic Endurance Expedition". Smithsonian. Retrieved 9 January 2016. ^ Hooton, Christopher (15 February 2011). "Ernest Shackleton Honoured with Birthday Google Doodle". Associated Newspapers Limited. Retrieved 15 February 2011. ^ Marks, Kathy (2 January 2013). "Team sets out to recreate Shackleton's epic journey". The Independent. Retrieved 2 January 2013. ^ a b "Sir Ernest Shackleton medals raise £585,000 at auction". BBC. 8 October 2015. Retrieved 10 October 2015. ^ Debelle, Penelope (11 February 2013). "Elation for Adelaide adventurer Tim Jarvis as epic Antarctic trek ends". News.com.au. Retrieved 21 September 2017. ^ Hartman, Darrell (1 December 2014). "Polar Explorer vs. Reality TV Crew: Tim Jarvis in the Footsteps of Shackleton". The Daily Beast. Retrieved 21 September 2017. ^ Brice, Rebecca (11 February 2013). "Shackleton adventurers complete epic re-enactment voyage". ABC News Australia: The World Today. Retrieved 21 September 2017. ^ Austin, Nigel (3 March 2013). "Adventurer Tim Jarvis survives to tell of his recreation of Sir Ernest Shackleton's Antarctic journey". The Advertiser. Retrieved 21 September 2017. ^ "Chasing Shackleton: Chasing Shackleton re-aired August 12, 2014". PBS. Retrieved 21 September 2017. ^ "Statue of Polar explorer Ernest Shackleton unveiled in Athy". ^ "The unveiling of Shackleton statue at Athy, Co. Kildare - Endurance Exhibition". 31 August 2016. ^ McPhee, Ryan (14 April 2017). "Ernest Shackleton Loves Me Off Broadway". Playbill. Retrieved 24 April 2017. ^ Sommers, Michael (2 May 2015). "Review: A Zany Version of the Romance 'Ernest Shackleton Loves Me' in New Brunswick". The New York Times. Retrieved 24 April 2017. ^ "Science and Art Catalogue: Sir Ernest Shackleton". Christie's. 8 October 2015. Retrieved 10 October 2015. Alexander, Caroline (1998). The Endurance: Shackleton's legendary Antarctic expedition. London: Bloomsbury. ISBN 0-7475-4123-X. Barczewski, Stephanie (2007). Antarctic Destinies: Scott, Shackleton and the changing face of heroism. London: Hambledon Continuum. ISBN 978-1-84725-192-3. Byrne, James Patrick (2008). Ireland and the Americas. ABC-CLIO. Crane, David (2005). Scott of the Antarctic. London: Harper Collins. ISBN 978-0-00-715068-7. Fiennes, Ranulph (2003). Captain Scott. Hodder & Stoughton Ltd. ISBN 0-340-82697-5. Fisher, Margery and James (1957). Shackleton. James Barrie Books Ltd.
Huntford, Roland (1985). Shackleton. London: Hodder & Stoughton. ISBN 0-340-25007-0. Kimmel, Elizabeth Cody (1999). Ice story: Shackleton's lost expedition. New York, N.Y.: Clarion Books. ISBN 978-0-395-91524-0. Mill, Hugh Robert (1923). "The Life of Sir Ernest Shackleton". Internet Archive (originally William Heinemann). Retrieved 7 December 2008. Mills, Leif (1999). Frank Wild. Whitby: Caedmon of Whitby. ISBN 0-905355-48-2. Morrell, Margot; Capparell, Stephanie (2001). Shackleton's Way: Leadership lessons from the great Antarctic explorer. New York, N.Y.: Viking. ISBN 0-670-89196-7. Perkins, Dennis N.T. (2000). Leading at the Edge: Leadership Lessons from the Extraordinary Saga of Shackleton's Antarctica Expedition. New York, N.Y.: AMACOM (a division of the American Management Association). ISBN 0-8144-0543-6. Preston, Diana (1997). A First Rate Tragedy: Captain Scott's Antarctic Expeditions. London: Constable & Co. ISBN 0-09-479530-4. Riffenburgh, Beau (2005). Nimrod: Ernest Shackleton and the Extraordinary Story of the 1907–09 British Antarctic Expedition. London: Bloomsbury Publishing. ISBN 0-7475-7253-4. Riffenburgh, Beau, ed. (October 2006). Encyclopedia of the Antarctic. 1. New York, N.Y.: Taylor & Francis Group. ISBN 978-0-415-97024-2. Shackleton, Ernest (1911). Heart of the Antarctic. London: William Heinemann. Shackleton, Ernest (1982) . South. London: Century Publishing. ISBN 0-7126-0111-2. Shackleton, Ernest (1919). South — Sir Ernest Shackleton's Glorious Epic of the Antarctic. BFI online. British Film Institute (BFIVO54). Retrieved 12 October 2011. Wheeler, Sara (2001). Cherry: A life of Apsley Cherry-Garrard. 2001: Jonathan Cape. ISBN 0-224-05004-4. Wilson, Edward A. (1975). Diary of the Discovery Expedition. London: Blandford Press. ISBN 0-7137-0431-4. Worsley, Frank A. (1931). Endurance: An Epic of Polar Adventure. London: Philip Allen. "Shackleton". Academy of Television Arts and Sciences. Retrieved 18 December 2011. "Historical figures: Ernest Shackleton (1874–1922)". BBC. Retrieved 11 October 2011. "Purchasing Power of British Pounds from 1264 to Present". MeasuringWorth. Retrieved 12 October 2011. "My South Polar Expedition". Australian Screen Online. The National Film and Sound Archive of Australia. 1910. Retrieved 12 October 2011. "Explorers' century-old whisky found in Antarctic". USA Today. 5 February 2010. Retrieved 14 October 2011. Katz, Gregory (18 January 2011). "Explorer's century-old scotch returns from Antarctica". Toronto Star. Associated Press. Retrieved 14 October 2011. "Shackleton, Antarctic Explorer, is Dead". The Spokane Spokesman-Review. Associated Press. 3 February 1922. Retrieved 13 April 2012. Lusher, Adam (27 November 2011). "Forgotten hero Frank Wild of Antarctic exploration finally laid to rest, beside his 'boss' Sir Ernest Shackleton". Telegraph. Retrieved 8 December 2011. "Whisky buried by Ernest Shackleton expedition recreated". BBC News. 4 April 2011. Retrieved 4 February 2012. Stansall, Ben (30 September 2011). "Shackleton's biscuit fetches tasty price". ABC News. Retrieved 30 September 2011. "Sir Ernest Shackleton CVO, OBE, FRGS, Polar Explorer and Freemason". Grand Lodge of Ireland. Hurley, Frank (2004). South with Endurance: Shackleton's Antarctic Expedition 1914–1917, the photographs of Frank Hurley. London: Bloomsbury. ISBN 0-7475-7534-7. Lansing, Alfred (2001). Endurance: Shackleton's Incredible Voyage. London: Weidenfeld & Nicolson. ISBN 978-0-297-82919-5. Mill, Hugh Robert (2006). The Life of Sir Ernest Shackleton. London: William Heinemann. Shackleton, Jonathan; MacKenna, John (2002). Shackleton: an Irishman in Antarctica. University of Wisconsin Press. ISBN 978-0-299-18620-3. Turley, Charles (1914). The Voyages of Captain Scott. London: Smith, Elder & Co.
Worsley, Frank A. (1999). Shackleton's Boat Journey. London: Pimlico. ISBN 0-7126-6574-9. "The James Caird Society". Retrieved 12 October 2011. "Sir Ernest Shackleton". Athy Heritage Centre Museum. Archived from the original on 11 April 2009. Retrieved 12 October 2011. "Archival material relating to Ernest Shackleton". UK National Archives.